"We utilize this unique tool to manage requisitions, approvals, and contractor ticketing. " Agiloft is very user friendly and has tremendous flexibility for you to customize your Knowledge Base and develop workflows to automate mundane tasks, eliminate human error, integrate with other software tools, and increase end user satisfaction. Once the platform is built, the implementation specialist arms you with all of the tools necessary to make modifications and updates as the need for tweaks arises. Agiloft has decreased our requisition approval turnaround time by four days - a huge value add to a fast pace high volume company like ours. "The best system for keeping track of the details." This product is powerful and customizable. Totally cool system. the people at Agiloft are the best part. They care and do help. For a good price. Very affordable. I find the instruction for customizing to be confusing. I usually need to call Agiloft. they always get me to where I want to go. This is a true enterprise product. The company is very helpful in many ways. Especially the custom support. This product is by far the best value out there at this time. I am keeping track of the details regarding projects we are working. Also keeping track of the people who are involved and the paperwork as well. It is awesome! This is going to sound boring, but Agiloft just works as it should. We migrated from a very basic system. Our last system required us to use it based on the way it was made to operate. Agiloft on the other hand has been customized to reflect our processes. For example, tickets get routed automatically based on the processes we are already using. This isn't exactly a complaint but when you get going with Agiloft, you can't expect their staff to do it all. What I mean is that, you will need someone to work with the Agiloft staff to flush out your operational processes. This isn't an off-the-shelf system, but rather one that will be customized to your specifications. Agiloft is very customizable. This is both a good and a bad thing-- you can mold it to what you want, but that also adds additional complexity. You can use a custom portal integration and users would never know they are utilizing the software. All they see is your customized portal with your brand. Can be a very robust application, but seems to be best suited for a larger environment. Perhaps it is how we have it setup, but I find the interface a bit clunky and difficult to maneuver and find what I need. Sometimes the responsiveness is slow, but that may be a resource constraint on the VMs that the application is running on. A very flexible platform that can be molded to suit your needs. That being said, smaller organizations may not be a good fit for this software unless you have staff or budget available to help customize the platform. As always, ensuring that you know what your business needs are before you implement will help you make your implementation of this or any other software successful. Does well with tracking all of our customer issues. We have developed a front-end portal that allows customers to create new issues without directly needing to login to Agiloft. This allows us to ensure we are meeting customer expectations and SLAs for issues that they submit to our service desk. Our BI team can create multiple reports that allow them to spot trends and ensure tickets are worked to completion. "The most customisable software Ive ever worked with"
The customisation capability is quite remarkable. The configuration can be completely customised to individual company requirements right down to field level. The user interface, colours, fonts, dashboards,and widgets can be tailored specific to a user, or group of users. Even reporting can be customised to use pre-existing business templates. Im yet to encounter a business scenario or process workflow that cant be configured within the system. The sheer customisation of the system could be daunting for some. That's why its imperative to seek professional advice in the initial phases. Definitely worth considering this product. "Coding-free customization and extreme flexibility puts power in the hands of CRM/ERP users"
4) Easy enough to customize that users can decide how to automate their own jobs, not rely on administrators or professional services, allowing the business to react quickly to changes in requirements. 2) I wish there were more and more complete sample customizations for the various applications the system can be used for. Because it's so easily customized, and because Agiloft's philosophy is to put that power in the hands of users, having a "close" base configuration would allow near instant deployment. 3) Include all your users in decisionmaking and delegate customization to first-level management if at all possible, keeping administrators and experts on hand to help. We switched from NetSuite CRM to Agiloft, because Agiloft could address fully custom support flows and timings which were necessary for our business. We are switching from NetSuite SFA to Agiloft SFA because our sales people and managers, like in most companies "have their own way" of doing things and want the tool to support them in it rather than forcing them to comply with a standard method or requiring expensive and extensive professional services. We are investigating switching our billing from NetSuite to Agiloft because we have confidence in Agiloft's management team and their intention to listen to what we need and provide it as fast as possible. "Implementation of IT Helpdesk, adhoc database solutions and development of Contract Mgt System "
Find a good third party vendor and build a strong relationship, help them understand your business. Small implementations/ trial/ less complex - these can be worked with an Agile methodology, great starting point. Large implementations/ complexity/ business critical - build requirements and configure. The interfaces/ UI does appear out-dated - regular users will overlook this due to the benefits of the tools flexibility and ability to build unique processes for your business. Have BA's trained/ trial the technology to be able to configure base reports and workflow. Discuss the technology and implementations with other users and build connections. Be prepared to implement workarounds in some cases to meet requirements. We have solved business problems of implementing an IT helpdesk with a 'light touch' ITIL framework, which meets the specific needs of our business. Greater reporting and metrics on IT tickets have been generated for focus on cost savings. From the creation of adhoc databases - external customer survey and internal quality assurance systems - we have created bespoke systems specific to our business without the need for complex coding. These Agiloft solutions mean we have not had to engage developers (Access/ SQL) and build systems which will require ongoing expert third party maintenance. The systems also have delivered time savings in the process and improved reporting. We are in the process of building requirements and developing Agiloft to replace the existing legacy ERP/ Contract Management System. This will provide numerous business benefits including a single source of truth, data integrity and enhanced workflow with significant reduction of manual process. "This has it all, from help desk to time sheets and everything in between." Sometimes when you're making a change, it will go a little crazy and you'll lose some data, you'll be able to recover it, but it does become frustrating when you can't change something quickly in the workflow. This is a very agile program which is simple to operate. It gives you full control over everything, yet is easy for the users to understand and use. They have a great implementation team and are very helpful when you have questions after implementation. By using this we have solved the problem of "Where is my request" and managers are held accountable for processing their departments requests. This program shows the requester and manager where the request is in the approval process. We are also using this as a help desk which tracks all help desk issues. It keeps my department accountable for providing support to the end users. A major benefit that we have realized is that all steps are streamlined and there is no lost time in trying to find the paperwork for a request. It also gives our IT department an complete view of the problems in a case. The Agiloft software is the most flexible, and scalable, platform I have ever worked with. Because of it's flexibility, and scalability, you don't have to have everything figured out right away. The platform allows you to grow the system as you go and incorporate new processes and functions as user input flows in. The lack of required custom coding is a really great feature. It allows us to develop and deploy in much faster intervals. If a user notices a choice missing from a drop down or needs a field added I can add it in a matter of minutes and they can keep working. It is hard to find a 'con' in the system though the lack of a 'clean' mobile interface and app is a bit annoying. In addition all the pop-ups that are required in the mobile interface becomes hard to track which pop-up is linked to what record. If you are looking to automate your entire business or just track contracts this platform can do it all and you don't need a million dollar IT budget to maintain it. This system can easily handle a mom and pop shop all the way up to a fortune 500 company. We are currently implementing Agiloft to vertically integrate all of our network assets and regulatory compliance data. Through the development of this 'documentation system' we will be able to quickly analyze our network performance metrics and show how we are achieving our high network availability policy. "The personalized customer support is what attracted us to Agiloft and they have not disappointed us!" We switched from Microsoft Dynamics CRM to Agiloft because we could never get any customer support when we needed it for the numerous issues we were having with their software. The switchover was practically painless and the personalized customer support we have received has been incredible! Any questions or issues I have had when initially setting up the new system were answered immediately and very professionally! Everyone I have dealt with has been extremely friendly and helpful and get back with me promptly! What a world of difference from the customer support we received (or didn't receive) from Microsoft Dynamics! I can't say that there is anything I dislike. There have been some server issues, but most of the time they have not affected us and the only reason I am aware of them is through their email informing us that there has been a problem and what they are doing to resolve it. If you're looking for a good CRM system with personalized and friendly customer support - Agiloft is the system for you! Our sales people are literally all around the globe and they need to update their CRM updates need to be entered in a timely manner often while they are on the road in far away places. In the past, often they were often not able to update on the road for various reasons and they would end up having to email me their required updates and I would have to enter them for them. This was time consuming for all of us and it would cause a lot to fall through the cracks simply because they couldn't update their opportunities themselves while they were thinking about their changes. Now we have none of those issues and all of our sales people are entering all their own updates as they have changes. A system can only be functional if it is used and now our CRM system is being fully utilized! "Safe Horizon has successfully implemented the Agiloft Contract Management System as tailored to meet"
Replaced a completely manual system requiring paper work to be routed from department to department with Agiloft's automated one eliminating most hard copy documents. "Agiloft began as a single need an evolved into an integral business system." Agiloft has a great deal of flexibility that allows you to streamline the operations within your business. We originally started with a help desk system that enabled us to better communicate with our customers. As we worked with the customers, we saw ways to expand and include other facets of our organization to improve the overall communications within the organization and with our customers. The system provided information on our customers that everyone in the organization can see. We were able to integrate cross referencing with other systems to ensure tracking was enabled throughout multiple systems. I would like to see improvements in the UI of the overall system; some areas are very dated looking. In addition, streamlining the search and replace functionality, I'd like to see this be accomplished with less clicks and pop-us opening. The Agiloft team does a thorough job of understanding your system needs and quickly implementing the system to have you online in the shortest amount of time. The ability to modify the system when your business requirements change in a timely manner is critical in business today and Agiloft provides that capability. We have solved tracking and servicing our customers. The system provides us the ability to keep a pulse on each customer and notify internal teams immediately. The system provides us the ability to search history across all customers at one time. This ability assists with cross-training new and existing employees and to quickly recommend already researched issues to other customers quickly. Agiloft is a very powerful platform that allows us to have custom automated workflows, access read/write restrictions, and design external custom interfaces with third party vendors. The platform is powerful if you understand your way around the system. It took a bit of time to get up to speed to use, and we had to use their internal consultant system to understand how to do some custom integrations. Consider the setup time required and budget for additional hours of extra consultant hours to build up the system. We are using agiloft to increase workflow efficiency and reduce turnaround times. "Custom software for an off-the-shelf price"
I'm continually amazed at how flexible Agiloft is. I use it for multiple purposes myself - Help Desk, Workflow, Document Management, and Project Management - and have also implemented custom business process applications for many of my clients. Once you get the hang of the customization (which is all done right in the browser, so you don't have to write any code), this software can do practically anything you need it to, for a much lower cost than typical custom software. It's also very reliable and fairly bug-free, especially compared to other custom solutions I've tried. It would be nice to see a few more out-of-the-box templates, but they do roll new ones out from time to time. It's easy to create your own applications though, so this isn't too much of a drawback - it would just save some time. Check out their website - there's a ton of information about all the features and all the different applications it can be used for, plus videos that show you how easy it is to customize. Start with a small application to get the hang of it, so you can learn the best way to customize it for your needs. Once you've got the hang of it, you'll have a much easier time with subsequent applications, and you'll begin to see all the different ways you can use the product. "Business process automation completely tweakable"
Agiloft offers a malleable solution to almost all types of business needs. It doesn't fall in any particular domain or industry. From service desk to contract management and custom BPM, it seems to be possible to implement just about any business need that one can think of. And more importantly, it becomes very easy for an administrator to configure new processes as soon as he learns the nuts and bolts of any single process. The look and feel is not on par with the competition. For example, it still uses browser pop ups all over the place making navigation a bit unwieldy. The UI requires unnecessary mouse clicks and some of the UI options are not so intuitive at first glance. But once a user gets to know the limitation, he can work around it. The functionality and feature set that Agiloft offers is beyond any other product, so it very much make up for the lack of GUI in the offering. Sign up for a free version and check out the various built-in features. Join the free webinars to get a hang on the default configuration. Then configure it to your liking. We wanted to manage our myriad different processes like internal IT, HR, customer service, contracts, etc under a single roof. Agiloft provided the answer. Now everything is streamlined and manageable. "Amazingly flexible and fast to customize"
Agiloft has an amazing breadth of features, but its greatest strength is flexibility. For complex operations, the out of the box solution is never a perfect fit and in other systems I haveused, you need into some pretty heavy programming to customize it to your needs. In Agiloft, it is all just point and click. And not just for trivial stuff, but for really deep changes. You can quite literally build completely new modules with their data relationships, workflows, reports, etc without writing a line of code. We are using it for issue tracking, service requests, asset management and CRM. The code is stable, they upgrade the hosted service with new functionality twice a year and their customer service is good, they actually remember us and it feels like they really care. Pricing is simply based on the number of our power users and customer access is free. There are a lot of options and they take some getting used to if you are the administrator. They have a free online training, but you cannot sign up directly from the website, you have to ask them to sign you up. Why not just put the link at the website??? In fact, I do not think they even mention the online training at the site. Take the time to write down a spec for what you really want to achieve, talk it through with them and get a demo of what it will actually look like. The custom demo is really important when your vendor shopping. We got burned with the preceding vendor who gave a slick demo of their out-of-box system and it really looked like a dream - till we tried to configure it for our needs and then it turned into a total nightmare of custom code, consulting overruns, etc. Agiloft was the exact opposite - the standard demo looked good, the custom demo looked better and the actual implementation went flawlessly (and was actually faster than we expected). If we had asked the first vendor to show our actual business processes running on their system, we could have avoided a lot of grief. Agiloft has been great for us, but every company is different so you should get a custom demo to make sure that it will work for you. We use it for bug and enhancement request tracking, manage service requests, provide automated reminders and keep track of everything. The biggest benefit is to rapidly review, prioritize and assign issues. We no longer have to waste management time on making sure that nothing drops through the tracks, preparing status reports or other "busy work". We have reliable metrics on numbers of issues, status, and av time to resolution, for the entire business. We now have a direct link to our free online training course on our website: http://www.agiloft.com/training.htm. Thanks for the feedback! "Affordable Software with Great Customer Service!" Getting started with Agiloft was incredibly quick and relatively painless. As a small business, I didn't have a lot to spend and Agiloft fit our budget. It's a great value - we get all the features we need and have been able to customize the product to match our existing workflow. I really didn't think I'd be able to find such a customized solution within our budget, but Agiloft fits the bill and more. Their customer service is fantastic - we feel like we're a highly valued customer, even though we're a small business. They are always quick to respond, and solve our issues quickly, even when we've caused them ourselves! Our Help Desk was very easy to set up, but had a bit more trouble getting our workflow set up. It probably would have gone a lot more smoothly if we'd used Agiloft's implementation service rather than trying to do it ourselves, but eventually we did figure it out. If you value great customer service, Agiloft is the product for you. Even during our initial free trial, we felt like their most important customer! Definitely take advantage of their implementation services if you need to do any complex customization. You can certainly figure it out yourself, but they'll get it done much faster. We're able to stay on top of customer requests and issues, so we're getting back to customers much more quickly. Emails are no longer falling through the cracks thanks to automatic alerts. We've started building up an FAQ which helps free up a lot of our time, since our customers can help themselves and find the answers they need. Overall our business is running much more efficiently thanks to the visibility Agiloft gives us into our operations. "Agloft has made our business run more smoothly, and saved us money in the process. " We are a full service marketing company, that focuses on web design. We use Agiloft for a variety of workflow tasks related to building websites and apps, such as bug tracking, version tracking, enhancement requests etc. What I personally like best is that it is incredibly easy to use, and surprisingly powerful. It's been able to do everything we've thrown at it without the need to resort to expensive custom programming. On a client level, our less technical customers are still able to use the bug reporting system without issue, as it is intuitive and easy to use. What do I dislike about Agilloft? Honestly, that I didn't find it sooner. As a company we had been proverbially banging our heads against the wall looking for a solution that fit our needs as a company for quite a long time. All of the 'off the shelf' offerings didn't work the way that we needed it to, and we wasted a lot of time on trials that were disappointing. Now that we finally have our systems in place, we are now a more efficient team, so I do not have anything negative to say. We have had no issues with the Agiloft product, and would recommend it to anyone looking to streamline their workflow, and make their business run at its highest level. Agiloft is now an integral part of our business, has made our business more robust. We are able to take on larger projects, and know that we have systems in place that makes everything run smoothly. When we were looking for a workflow and help desk solution, we had a hard time finding one off the shelf that suited all of our needs. Agiloft tailored a system for us and had us up and running very quickly. The biggest benefits have been in our management of customers during our build phase, as well as aftercare, and our internal workflow. "Agiloft's interface makes it intuitive for to administer from a technical perspective." Our teams use Agiloft for ticketing and document management. The ease of navigation and setting up dashboards has been relatively seamless. Also, the workflows can be setup with relative ease. Automating the back ups (.xml.ew) integrates well with our Commvault back up solution for file. Agiloft really fits meets most of our needs. In the future we will likely use MS SQL Server for the back end. The only concern we have with Agiloft is the amount of time it take Jboss to start after a reboot. It can take up to 20 minutes for the site to render. I will follow up with support on this. We are able to track, audit and analyze the number of calls we receive with a specified time period. Our clients and partners have the ability to run reports and view the dashboards to see the progress and the amount of work our team accomplishes. Easy to use, easy to set up, smooth and seamless transfer of data. Easy navigation and I like the ability to personalise reports, searches, dashboards, graphs, templates and emails. Data is stored logically and all tables are linked, so data is entered only once and yet I can view it from different perspectives. Absolutely nothing, I use it everyday and have no issues or complaints. Like any system, once you know your requirements, Agiloft is easy to set up and implement. User Interfaces are configurable, views and searches are easy to create and save, everything is configurable, easy to understand and easy to use, it meets all our requirements and more. Our Business Problem was about having a working and functioning CRM/SCM that kept track of leads, customers, correspondence, documents, contracts and tasks. Agiloft does all this with ease, in one place. "Powerful tool but should be cleaned up"
"The most agile and affordable Business Process Automation software I have ever seen." Automation: Business rules / workflow can be put in place, without a single line of code. Email integration: inbound and Outbound emails managed within Agiloft, to get a 360 degrees of vision. "Agiloft keeps our office on the same page"
Agiloft helped us get rid of lots of manual processes and overlapping spreadsheets. Everything is now in one place, with everyone on the same page. It's so much easier to find information and documents. I would like to be able to customize the colors and fonts of the charts, but it's not a big deal. If you're tired of juggling spreadsheets, give it a try! I save lots of time since I no longer have to update multiple spreadsheets with the same information. Communications with our clients also improved, since they are automatically informed of updates and can check the status of their case at any time. I also get much faster responses from our IT guy, which is great. "Wonderful Software with Great Customer Service!" Working with Agiloft I was most impressed with their customer service and ability to connect with the customer. They have a great product, an honest sales team, and were very realistic with price quotes and time frame. I was very impressed by their free demo they did. They demonstrated how quickly and easily a contract can be created or managed. The demo was a very interesting insight to how the software works and the sales team was able to quickly answer all my questions and show me all the possibilities of the software. The sales team as well as the implementor was organized, professional, and answered all of my questions. I had a really wonderful experience with the company. I was generally happy with every aspect of Agiloft. Their easy to use software benefited my business and was a great use of resources. It literally can take any form you need and help you create it. I would recommend Agiloft to other business owners. It has especially helped me manage contracts for my own sales, liability forms, etc. The benefits to Agiloft have really had a positive impact on our company. It's made forms and contracts very accessible and easy to manage even for a non-tech business. Although I love the software, I really appreciated how personable the sales team and implementers were, which I've found can be rare in the tech industry. "Agiloft has been a strong parther for Shorenstein Realty Services"
1) Great flexibility in building a solution. 8) Agiloft's passion for their products and desire to become the best. 1. We are in the middle of implementing a new Real Estate ERP system. Agiloft is helping us to adapt our Enterprise Help system to a significant shift in our navigation and routing requirements. 2. Our strategic direction is toward the ITIL model and we love Agiloft's implementation. "Great software with excellent features"
We use Agiloft to help us track and manage a wide variety of customer data issues. 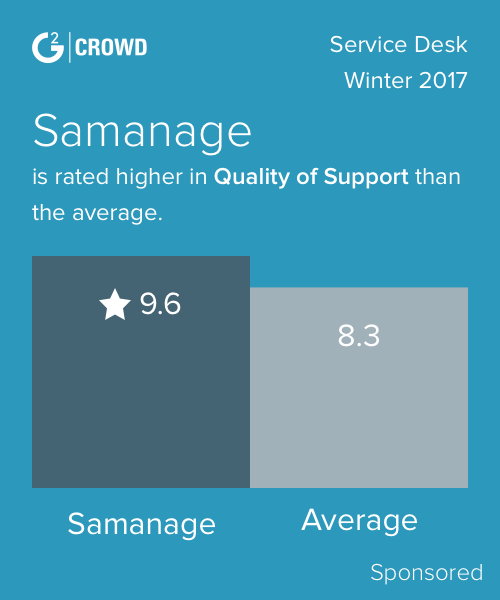 similar to helpdesk software, but with powerful data collection and categorization issues, it helps us manage complexity. we were an initial early adopter of Agiloft. some initial learning issues, but we survived them! very powerful software product. has some learning curve, worth exploring functionality. Customer data and reporting issues are made easy with software. we use the rules and categorization options to help us manage client data and helpdesk like problems. "It just worked from day one"
We are a multi platform company with partnerships with various products and services. We required a CRM, Helpdesk and Sales Software that touched at various points in our work processes. With very minimal configuration Agiloft just worked from day one. We've used and promoted it ever since. It's benefits are it's downfall in some respects. The system is so complex, with so much functionality that it can be daunting at first. It takes time to familiarize yourself with the current configuration. An easier instruction manual or tutorial of the current demo data would be advantageous. Sales leads are managed more efficiently. Support cases are managed quickly and efficiently. Customer data is managed effectively. "Agiloft is the most versatile and fully customizable CRM software package I was able to find." With Agiloft, all of the modules are included, so there are no extra fees for activating additional modules. All we have to do is enable the new functions we want to use, and then customize them for our specific needs, so our Agiloft knowledgebase and functionality can grow and develop as we grow. The flexibility of the Agiloft software can make it seem overwhelming to customize. Currently, they offer a week-long, in-depth training class that would be more helpful to me if it was offered online as it is difficult to commit to being out of town for a week to attend the training. The Agiloft website has some short training videos that both show you how to use certain functions and also help outline the functionality available (for those of us who don't always know what we're looking for until we see it). The Automated Workflow facilitates constant communication keeping all parties on the same page at all times, and the centralized knowledge base (accessible anytime from anywhere) has greatly improved our efficiency. ability to create tickets and assign them to support techs. Ability to manage support cases. "Agiloft Review from Healthcare Non-Profit Perspective"
It gives you the ability to create an entire CRM system without previous programming knowledge. This enables you to create a system quickly, that enables you to build customized new features without a reliance on costly developers. I believe that the graphical reporting output interfaces would use an overhaul. They appear a bit dated in their look, and I would like the ability to customize more details of each chart/graph. We are using the tool for tracking our sales process, contracting process, invoicing process, and end user training. We have realized large gains in the efficiency of our employees due to the numerous tasks we were able to automate with Agiloft. The tool has been great for the ability of management to pinpoint exactly what is going on via the use of customized reports. "Giving us one place for all of our processes and workflows"
It allows us to customize the program to get exactly what we need. There is a lack of documentation for its functionality. A lot of our learning has been either intuitive through trial and error, or through support and consulting hours. Make sure to use the support portal when stuck. Their help and responses are extremely valuable. As are the consulting hours. Now there is one place for processes, instead of several places to do different things, each a different way. Now everything is similar, streamlined, and connected. "Agiloft is a very versatile"
The product has endless possibilities and fits are need. I really don't have anything bad to say about the product. Great value proposition. The system gives you many options that allow you to solve many of your daily problems. We are using the system for mileage reporting and are working to implementing a safety reporting system using agiloft. "Elaborate .. Yet Simply Easy!" Implementation was quick and uncomplicated. Out of the box readiness for standards based ITIL Service Desk environment. What more could one ask for. Customer portal at first had little "flare" from a GUI context. Functionally the customer portal was dead on. Recent versions have shown more attention to GUI and ability to integrate into your pre-existing service desk web design. Centralizing a state-wide service desk environment while quickly integrating resources that did not have a formal background in service desk environments or workflows. AgiLoft simplified this process for us through quick implementation and easily customized staff interfaces. "Agiloft an excellent flexible option, that can expand functionality as required"
Agiloft has a comprehensive set of functionality that can be turned on when required. resulting in less confusion and overload for users. Agiloft has solved our CRM requirements well, but also enabled integration with other proprietary systems at relative low cost. "Very nice product. Great value"
Ticket tracking, communication to/from end user, speed, data capture, metrics have all improved since we started using Agiloft. For the price, Agiloft is an extremely good value. It has many functionalities that you would think you couldn't get unless you paid a far higher price. The ease of use of the web portal for tracking our customers' issues. I have not run across anything which we dislike. We are tracking our customer issues and use the workflow modules to route calls to appropriate engineers to respond within our service level agreements. "Agiloft has proven a beneficial partner to our telecommunications repair service business"
The most appealing benefits of Agiloft are the ability to customize the knowledge base to our specific needs and the superior customer service which receive. We have been with Agiloft for over a year and I have no complaints of any kind. The ability for multiple locations to see the same data real time allows for immediate updates of where customer product is in the process. Repair history, component usage, customer tracking, are all just a few of the improved benefits from Agiloft. "Agiloft user for more than 3 years"
It has a lot of tools for use for a variety of purposes. "We were able to greatly increase efficiency and productivity." The ease of the system for users and the excellent support. Not very userful friendly from a Administrative standpoint if you are not a computer programmer. We are able to keep track of contracts and insurance certificates more efficiently. The system gives notifications on when these things are expiring. "Good team to work with." Agiloft takes product quality seriously. If you uncover an issue, they are responsive and will give the fix high priority. Some UI components could be improved, but I understand this is on the near-term roadmap. We manage customer support cases with the software. * We monitor all Agiloft reviews to prevent fraudulent reviews and keep review quality high. We do not post reviews by company employees or direct competitors. Validated reviews require the user to submit a screenshot of the product containing their user ID, in order to verify a user is an actual user of the product.